My friend Suresh is looking for safe investment option. In recent past he lost a couple of money in stock market and now he want to invest only in safe investment options. 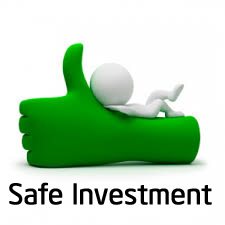 I know many of you must be looking for safe investment option for investment. To help you out I have evaluated various investment options and here is 10 Best Safe Investments in India along with tenure, return, tax applicability and other details. Fixed deposit of bank is said as one of the best safe investment in India because as per guideline of RBI, bank needs to take insurance of deposit placed by you. In fixed deposit rates of return is fixed and known, there is no uncertainty. Tax is applicable as per slab on FD to avoid TDS on FD you can submit form 15H/15G. You can download 15H/15G form from here. Fixed deposit investment gives moderate return and best for small investor. Recurring deposit is special kind of deposit where you need to deposit specific amount at monthly interval. In simple language it is making fixed deposit every month. Return of fixed deposit will be slightly higher than fixed deposit as in recurring deposit you are doing investments in parts. Tax Applicability – Amount for Investment is deducted from your taxable income up to 1 Lac (80 C). Tax is applicable on interest income. Tax saving deposit is another form of safe investment. Tax saving fixed deposit is fixed deposit which you can use for tax saving. Drawback with tax saving fixed deposit is your money will be locked for 5 years. Tax Applicability – Amount for Investment is deducted from your taxable income up to 1 Lac (80 C). Return in tax-free. PPF is one of the safe investment option. PPF will give you very good return provided you wait for 15 years. No other fixed investment instrument can match return of PPF. Even return from PPF is tax-free. MIS is post office scheme suitable for retired employees/ Senior Citizens. You can invest from 1500 Rs/- to 4.5 Lakh in this scheme. It is safe investment option as Post office is directly managed by government of India. As name suggest interest income can be withdrawn by investor on monthly basis. Tax Applicability – Interest income is taxable, Investment amount is eligible for 80 C deduction. Senior citizen saving scheme is for senior citizen only. Senior citizen can visit nearest post office or designated bank to open senior citizen saving scheme account. This scheme gives good returns but investment is allowed by senior citizen only. NSC is another safe investment with decent returns. NSC can be purchased from Post office. FMP is another form of safe investment. Compare to FD here insurance is not taken as capital protection and returns are not fixed but yet it is found that FMP gives better return compare to FD. FMP falls in category of mutual funds. Debt mutual funds are like FMP only, return in debt mutual funds is not fixed so if you don’t want any uncertainty this option is not for you. Debt mutual funds invest money in fixed investment instruments. Debt mutual funds are easy to buy and sell. In recent past debt mutual funds has given good returns. Saving bank is another safe place to place your money especially emergency fund. Don’t place excessive money in saving bank consider another investment options like FD etc. So I am through with 10 Best safe investment option Invest in this instrument based on your goal and requirements. Do let me know if I have missed anything in above list. i am going to sell my Land and amount is around 55 lak. I am single, my mother is a senior citizen. Now i have decided to buy a flat around 30-35 and rest of the money i want to invest .So how do i invest rest of the money for coming 5-6 years? I would advise to split fund on three parts and make investment in mutual funds,fixed deposit and equity. if govt of india changes next elections then what happens to Govt of India Bonds 8% half yearly payout to bank account and invested for 6 yrs – next govt can say now its new govt new rules – then does investor need to prove he is investor to get back principle and due int etc . as it is no acche din as yet? i am going to sell my property and value of same is around 30 lac.now i don’t want to buy any property in coming 5 years so what is the best way to invest this amount for 5-6 years. I am married and blessed with a daughter of 19 months. It is best to split money in three parts. (1) Equity (2) Debt investment (3) Mutual Funds. Invest 40% in equity,40% in good mutual funds via SIP and remaining 20% in Fixed Deposit. I suggest you to explore good debt and balance mutual funds for investment. What is the age limit for investing under SCSS? My mom is 65 years old, can I open a SCSS account for her? Dear Padmini, Minimum Eligible age for SCSS is 60 Years.